Feel free to join us at any of these events! Join us for a belated opening celebration of our latest exhibition at Holly Kai Gallery, featuring the art of Milly Sharple and music from Joy Canadeo. Up on the rooftop events area. Gyro Muggins reads John Brunner’s 1980 novel about matter teleportation and dimensional shifts. At Seanchai Library. With Aoife Lorefield at Seanchai Library. With Gerard Winstanley at Caitinara Bar. Corwyn Allen reads the second volume in the Laundry Files by Charles Stross at Seanchai Library. With Shandon Loring at Seanchai Library. Aft the unfortunate issues with Second Life on Sunday, Octber 28th, we were forced to cancel the opening event for Milly Sharple’s art exhibition. So – we’re crossing fingers and toes and trying again! Please join us from 3:00pm SLT on the rooftop events area at Holly Kai Gallery for music by Joy Candeo, as we celebrate the Art of Milly Sharple. The exhibition is open in the gallery, so please take the time to visit her awesome art! Dress code: semi-formal or formal, and we look forward to seeing you at Holly Kai Gallery! We are pleased to announce the opening of next exhibition of art Holly Kai Gallery, at 3:00pm SLT on Sunday, October 28th, 2018, featuring the work of Milly Sharple. A photographer in the physical world, Milly Sharple has always enjoyed art and artistic expression, entering the world of fractal art in 2005 – and perhaps was one of the pioneers in introducing fractal art to Second Life audiences – although art wasn’t the reason behind her initially signing-up to the platform in 2008. Given her success with her fractal art in the physical world – where she has sold pieces around the globe and had them used as book and CD cover art, as promotional material – and most recently by an Indonesian bank as the art on their bank cards – Milly understandably wanted to exhibit her work in-world, only to meet with comments that fractal art wasn’t a suitable subject for Second Life. Fortunately, she didn’t take this feedback to heart. Instead, she established her own modest gallery and displayed her work there, and within 12 months had received multiple invitations to publicly exhibit her work, and once started, they didn’t stop. In the years since, Milly has exhibited her work across Second Life in response to invitations from numerous galleries, and has often sought to display entirely new work with each invitation. Becoming immersed in the SL art community also encouraged her to establish the Timamoon Arts Community, a place where artists – especially those new to art in SL or who were using the platform to express themselves through art – could find a gallery home and like minds. Over four years, Milly grew Timamoon into one of the most successful and popular art communities, while her own diverse interests in SL continues to spread. In particular, these wider interests have included terraforming, region design and building. In this, her Let It Snow winter-themed builds have been widely blogged about as well as visited, and are regarded a Second Life Christmas tradition among grid explorers. For her fractal art, Milly mostly uses Apophysis, a software package that allows the creation of soft, flowing, liquid effects. These have always given her work a unique and richly natural look and feel when compared to the more technical and geometrically angular fractal art that is often seen. She also likes to take a broad approach to her work, noting she enjoys creating images on light backgrounds as much as on dark ones, and will work with vibrant palettes as often as more muted mixes. he opening of the exhibition will be marked with a gathering at the gallery’s rooftop entertainment space, featuring music by Joy Canadeo and commencing at 3:00pm on Sunday, October 28th. Formal or semi-formal dress is requested for the event, and an invitation is extended to all to attend. The exhibition itself will remain open through until Saturday, November 24th, 2018, inclusive. 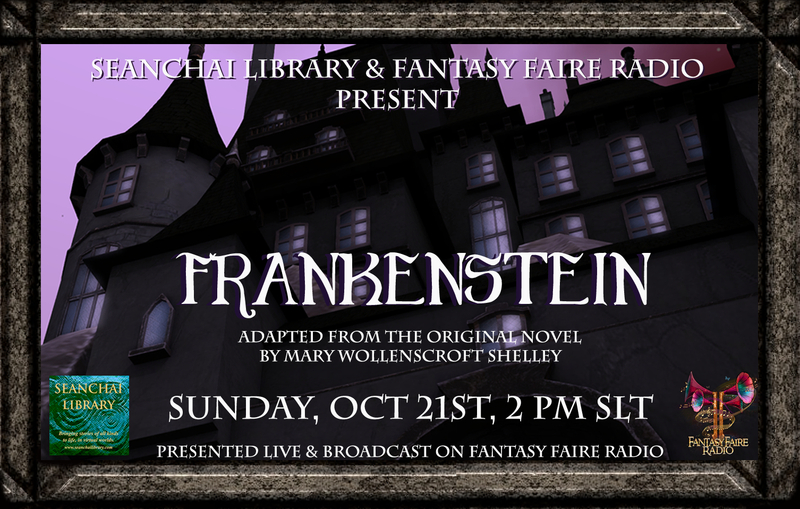 On Sunday, October 21st at 14:00 SLT, Fantasy Faire Radio and Seanchai Library will present Mary Shelley’s Frankenstein, specially adapted for radio and live performance in six voices, in celebration of the 200th anniversary of the novel’s original publication. The two-hour performance will take place live at this year’s iteration of “Haunted Holly Kai” high above the Blake Sea based Art Park, and will benefit Relay for Life. Whilst holidaying near Geneva, Switzerland with her lover (and later husband) Percy Bysshe Shelley and Lord Byron, Mary Godwin (already calling herself “Mary Shelley”) entered into a challenge with her companions to write a “ghost story”; the result of all three having been reading German ghost stories to their company in the evenings. Unable to develop an idea for a traditional ghost story, Mary became inspired by a discussion on the nature of the principle of life, eventually sitting down to write a story that would become one of the most enduring horror stories of all time: Frankenstein: or, The Modern Prometheus, first published in 1818. Over time, the novel became the subject of stage plays (starting in 1823) and films (the first made in in 1910) – the most famous of the latter probably being the 1931 James Whale film, Frankenstein: The Man Who Made The Monster. Itself adapted from a stage play by Peggy Webling and loosely written around Shelley’s novel, the film starred Boris Karloff, in a role that transformed Shelley Creature into the Monster with bolts in its neck we all tend to visualise when thinking about the tale. For the 200th anniversary of the novel’s publication, Seanchai Library and Fantasy Faire Radio will present a 2-hour adaptation of the original story, adapted by Caledonia Skytower and Da5id Abbot, who will be joined by the voice talents of Corwyn Allen, Zander Greene, Shandon Loring and Elrik Merlin.. The performance will take place in an outdoor amphitheatre and castle setting that features a mad scientist lab created by Stranger Nightfire. Both the amphitheatre and castle will remain open to the public through until after Halloween, and will feature additional events will be staged to celebrate both the novel and its film adaptations. To reach the event area, click the Frankenstein poster located on the wall at the Holly Kai Park Information Centre. Seanchai Library (Shawn-a-kee, which means “Storyteller” in Irish.) was founded in March of 2008 in Second Life. The program remains dedicated to promoting the power of stories to transform and inspire through live voice presentations: “We bring stories of all kinds to life, in Second Life and other virtual worlds.” http://irelandslstory.blogspot.com/. Since 2014, Fantasy Faire Radio has been a special event station, sponsored by Radio Riel in its role as Media Partner in Fantasy Faire, the annual celebration of fantasy art, writing, design and creativity that raises money every year in the virtual world of Second Life for the American Cancer Society’s Relay For Life, supporting cancer research, caregivers and cancer sufferers all over the world. In 2017, FFR began broadcasting 24/7, as a full‐time Internet radio service. Listeners can tune in by opening https://radioriel.org in their internet browser and choosing Fantasy Faire Radio in the left hand sidebar, by opening http://fantasy.radioriel.org in a network audio player. Join us on Sunday, October 14th, 2018 for the first in the new series of Stories at the Park. Poems can be UP TO 100 words, but no longer, and in any format (blank verse, iambic pentameter, haiku, sonnet, whatever appeals). Submitted stories are then read in the live voice session for each Stories at the Park event, which take place at the Holly Kai Gallery, allowing attendees to both listen to the stories and explore the art for themselves. All stories are presented in voice, and can be read by the authors or if they prefer, have one of the Seanchai Library staff read their work. Submitted stories are also published in this blog – see the stories index, for past events. At 3:00pm SLT on Sunday, October 14th stories and poems written for the current exhibition, The Art of Lu: Fantasy and Nature – featuring the art of Lu Anne Anatine. A professional illustrator and digital artist in the physical world, Lu Anne produces some of the most stunning art to be seen in Second Life, producing her art through a fascinating mix of traditional and digital mix of mediums. For example, she produces a base drawing or painting in graphite or water-colour, then scan the images into her computer where she paints them digitally using a Wacom Cintiq tablet and a number of programs. You can read our preview of her exhibition here, and we hope you will join us at 3:00pm on Sunday, October, 14th, 2018. We are pleased to announce that our current exhibition, The Art of Lu is being extended by 48 hours, and will now close on Monday, October 15th, 2018. Similarly, Stories at the Park, which had been scheduled for Sunday, October 7th, 2018, will now take place on Sunday, October 14th, again at 3:00pm. The result s are painting that are breathtaking in their complexity and beauty, as the images here hopefully demonstrate. So, if you have not already visited the Art of Lu, we urge you to do so – and to join us on Sunday, October 14th for Stories at the Park. Opening at Holly Kai Gallery at 3:00pm SLT on Saturday, September 15th 2018, is our newest exhibition – and the first to be held in the gallery’s new halls. The Art of Lu: Fantasy and Nature features the stunning artwork of Lu Anne Anatine, who brings her magnificent art into Second Life for our enjoyment and appreciation. Lu Anne, a professional illustrator and designer, produces the most incredible studies from the worlds of fantasy and nature by digital means, and Art of Lu is a 4-week celebration of her work. The materials I use are a traditional and digital mix of mediums. I will render in graphite the line work for the paintings then scan them into Photoshop so then I can paint digitally. I use a Wacom Cintique to paint and the programs I use cross between Photoshop and Corel Painter. I may even use other traditional mediums like watercolour as an under painting that gets scanned as well the possibilities are endless. Join us for the opening of this magnificent exhibition, featuring the music of DJ Joy Canadeo, at the rooftop events area of Holly Kai Gallery, and afterwards, take a stroll down to the gallery halls to see Lu Anne’s work. Formal / semi-formal wear appreciated, thank you.